On Monday morning, the Tampa Bay Buccaneers unveiled their new uniforms. Much to some people’s chagrin (see: this guy), they didn’t go back to the terrifically hideous creamsicle threads of yesteryear. We were a little bit mixed over the new duds here at Gamedayr HQ, so we decided to check the pulse of social media. The Twitterverse is never short on opinions, and this was no exception. Here are some of the best reactions from fans and media over the new-look Bucs. Tampa Bay Bucs going with the “arena football” look, not necessarily a bad thing. The bigger logo on the helmet is pretty dope, though. 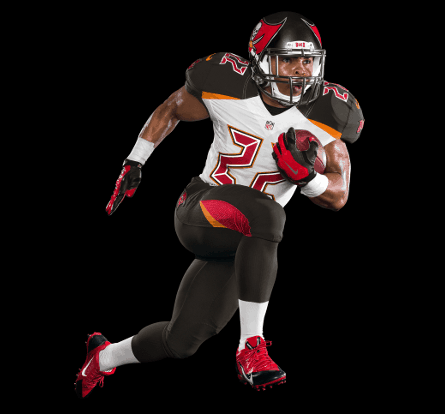 The new Tampa Bay Bucs jerseys look like something someone made on Madden 07. The best way I could sum up Tampa Bay Bucs new un’s is they look like the 1993 version of what we thought 2014 uni’s would look like. So…..the new Tampa Bay Bucs jerseys are pretty terrible. Classic case of trying to fix something that wasn’t broke. I don’t hate the new Tampa Bay Bucs uniforms. I love the the Tampa Bay Bucs new uniforms. Now they ACTUALLY look and play like an arena football team.